18/10/10 – Heritage – Arc-sur-Tille, church – Every once in a while, we hear excellent news although in our troubled times it may not be as often as we wish. On 6 December 2010, the Arc-sur-Tille city council in an almost unanimous vote annulled the decision made by the previous mayor to destroy the village church claiming that a restoration would be too expensive. The Art Tribune had vigorously condemned this planned act of vandalism on a building of great value to art history (see the articles in French) and we had supported the petition launched by the association, UEPA (Une Eglise pour Arc-sur-Tille). After the former mayor was defeated in the last election, it seemed that a solution would be found (see news item in French of 20/3/08). This has now been confirmed. 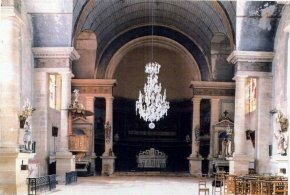 The church will be restored progressively, depending on availability of funds, and a first stage is planned at 362.070 euros. Also, we should point out that this unprotected building deserves to be listed . This case shows how one can always avoid the worst and that churches condemned by mayors who have no sensitivity to their cultural heritage can still be saved. The arguments used here by the former mayor to destroy the church are the same as those brandished whenever a religious building is threatened, for example in Abbeville for the church of Saint-Jacques (see articles). The elected vandals claim that the restoration costs would be too high and that the only solution is demolishing it, when in fact simply keeping the church is always much less expensive and the rehabilitation can be carried out over a period of several years. Let us hope that the case of Arc-sur-Tille will set an example for all. The government has not been very active, to put it mildly, in helping to save this building (see article).